Faculty of Business and Finance (FBF) Senior Lecturer Garry Tan Wei Han’s research paper recently received double recognition from world-leading academic publishing company, Elsevier (USA). Titled “NFC Mobile Credit Card: The Next Frontier of Mobile Payment?”, the co-authored paper by Tan, Prof Dr Ooi Keng Boon of UCSI University, Dr Chong Siong Choy of Finance Accreditation Agency, Malaysia and Hew Teck Soon of University of Malaya, was recognised as the most cited paper between 2010 and 2015 based on the number of citations by Elsevier’s Scopus, the largest abstract and citation database of peer-reviewed literature. The paper was also acknowledged as the most downloaded article between May to July 2014 for Telematics and Informatics, an interdisciplinary Elsevier journal examining the social, economic, political and cultural impacts and challenges of information and communication technologies. 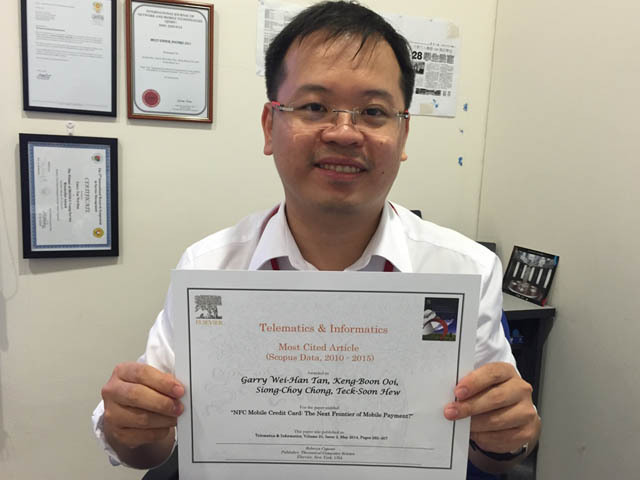 “To have the Telematics and Informatics Editor-in-chief Prof Jan Servaes, who is also a prominent professor at the City University of Hong Kong accepting our paper is truly an honour,” remarked Tan, who added that the paper was also ranked 4th in Telematics and Informatics’s Top 25 Hottest Articles in 2014. “NFC Mobile Credit Card: The Next Frontier of Mobile Payment?” can be retrieved from Telematics & Informatics, Volume 31, Issue 2, May 2014, Pages 292-307. Click here to download.